A statue of Johnny Tapia entitled “Boxing Victory 21 Celebration,” created by artist Steve Weems will also be unveiled at the Community Center. Johnny Tapia was raised by his grandparents in Wells Park and participated in various recreation programs at the center where he later worked as a recreation leader. From 1:00 - 5:00 pm, South Valley Boxing Club and Chavez Promotions presents a WBC and USA Boxing Tournament at Civic Plaza featuring amateur fighters from around the Southwest. 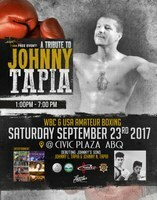 Johnny Tapia’s sons, Johnny “Niccolai” Tapia, and Johnny “Lorenzo” Tapia will be making their first amateur fight appearance in Albuquerque at this boxing event. A concert will follow at 5:00 pm with New Mexico Musicians: Al Muniz with special guest Timo Martinez, Lori Ortega, Red Wine and Legacy of Santa Fe. Both the concert and the boxing tournament are free. In June 2017, Johnny was inducted into the International Boxing Hall of Fame. 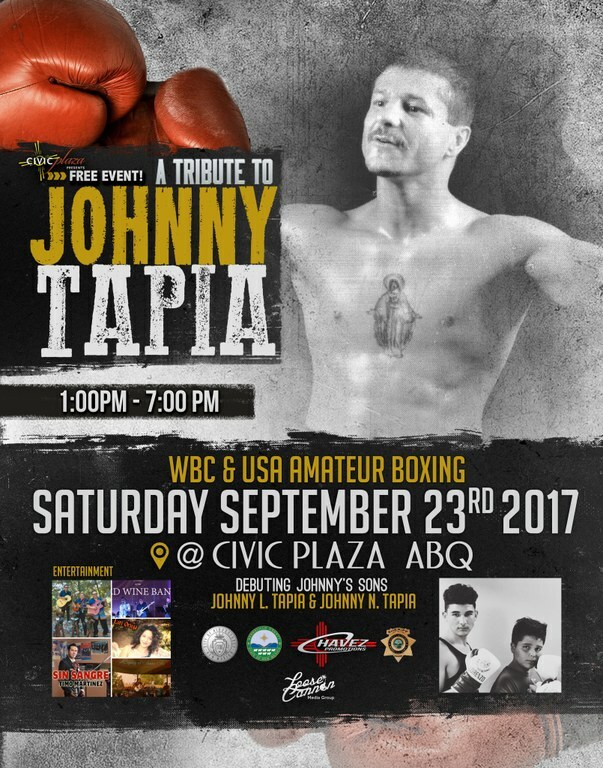 Johnny always talked about his love for his hometown and September 23rd will be a day to honor Johnny Tapia’s world class achievements in the sport of boxing and pay tribute to a native son.